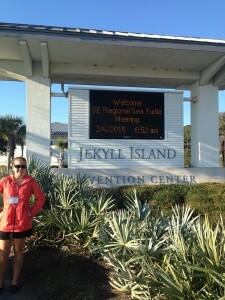 Rachel Miller beside the Jekyll Island Convention Center where the Sea Turtle conference was held. Earlier in February, Rachel Miller, the Research Assistant for the Sea Turtle Conservation Program, attended the Southeast Regional Sea Turtle Meeting in Jekyll Island, GA, a five-day conference that focused on the newest sea turtle research from the Southeast United States. In addition to learning about the newest sea turtle research, Rachel had the opportunity to meet with top scientists, upcoming scientists, and Island School alumni. At the conference, Rachel met IS alumna Sarah Kollar (S’07) who is working with the Trash Free Seas division of the Ocean Conservancy in Washington, DC. It’s awesome to see where Island School has reached! You can find out more about SERST here.